MONSTER MIX is a proprietary mixture of White Clover, Red Clover and Chicory that is as good for attraction as it is for nutrition. With its unparalleled highly digestible protein, white clover has long been a part of trophy whitetail management throughout the Midwest, Northeast and Southeast. However, the addition of Chicory boosts the overall production and growing season as well as providing plant diversity. Monster Mix withstands heavy browsing pressure, while providing antler-building protein levels over 30% and even higher levels of beneficial phosphorous. In addition, Chicory provides tannins that benefit the rumen of deer and elk. Monster Mix last for 2-5 years and grows through most of the year. 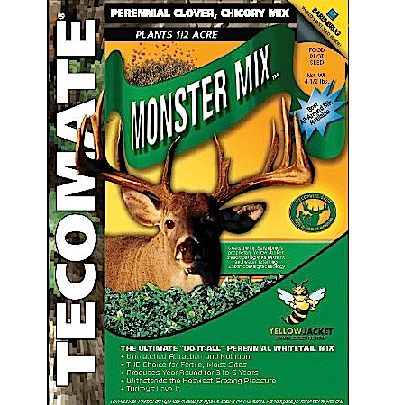 Best of all, Tecomate Monster Mix includes Yellow Jacket seed coating containing moisture retaining Zeba. This unique and proprietary technology has been scientifically proven to provide a quicker, healthier food plot. Monster Mix is regionally formulated and is ideal for zones 1, 2, & 3. Plant in a sunny location that has been disked to a clean, level and firm seedbed. Tecomate recommends liming if the pH is below 6.5 and fertilizing with a phosphorous heavy fertilizer at the rate of 200 to 300 pounds per acre. Monster Mix is pre-inoculated and coated with Yellow Jacket for fast germination. No-till drill, cultivate and broadcast or cultivate and drill seed. Plant at a rate of 8 pounds per acre. When broadcasting, cover seed by lightly dragging or cultipacking. Avoid planting too deep, disking is NOT recommended. Plant 1/8 to ¼ inch deep in good moisture. Frost seeding is acceptable in colder climates.